Torklift International, an industry leader in after-market upgrades and accessories for truck campers, caravans and other recreational vehicles, has been selling its made-in-Washington products to camping enthusiasts around the world for decades. For the most part, though, international customers were going online or working through an authorized dealer to buy tow bars, hitches, turnbuckles, truss extensions, tie-downs and other hardware, which meant the single-item shipping costs were high and the delivery time could be weeks, if not months. With a relatively large and growing customer base in Australia, the family-run, Kent-based company started wondering if the customer demand could support a distribution center Down Under. Enter the SBDC’s Western Washington Export Center. In 2014, SBDC International Trade Specialist Sharon Sappington started working with Torklift executives on an expanded export strategy, which included a third-party distribution center in Australia. As part of that, she introduced the services of the SBDC global research team comprised of students from Washington State University and a handful of other universities across the state. The SBDC global research team was tasked with the job of finding data that would allow Torklift to decide whether to open a distribution center in Australia, where to locate it and what to stock on the shelves. Sappington, working with General Manager Jay Taylor and other Torklift executives, came up with 17 questions for the team and the team responded with a 16-page annotated report and 10 attachments. The distribution center opened in Sydney in 2015 and Torklift is now planning new distribution centers in Europe. 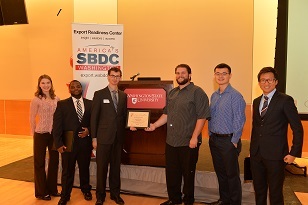 The Washington SBDC research program received an Award of Excellence in 2014 from the University Economic Development Association and has become a model for other SBDC internship programs. The Washington SBDC internship for international market research was started in 2011 to support a state economic revitalization grant to increase Washington exports. Since then it has grown into a model program for other SBDC programs. Since 2011, the Washington SBDC has coached more than 60 college students from six different universities to provide valuable market research to nearly 400 SBDC clients. “The internship is an opportunity for college students to become better prepared for the workplace while also helping Washington businesses make critical decisions,” said Tim Taylor, supervisor of the SBDC market research internship program. According to Taylor, the research team completed 146 projects in 2015, logging a total of 4,397 hours on behalf of SBDC clients. Along with students from Washington State University and Gonzaga University, students from Eastern Washington, Western Washington, University of Portland and Whitworth University have also participated. Each report is tailored to the specific needs of each client, Taylor said, so some reports compile data on specific product in a specific country or region, but other reports might look at market opportunities in up to three different countries. While the team’s primary focus is international research, the group started accepting domestic market research requests in 2015. So far, Taylor said, most requests involve Europe, Asia, the Americas and Australia. A few requests have come in for research in Africa, India, the Nordic regions and Eastern Europe, including Russia, but not many, he said. In 2015 alone, the research team investigated market opportunities in 120 countries related to more than 60 different products or services, including vitamins, processed food, exercise equipment, wine, beer, cosmetics, bees, pet food, gas stations, flavoring, exercise studios, athletic events, counseling, beauty salons, technology, food safety, elderly services, utilities, leather products, agricultural equipment and travel. In the first three months of 2016, the SBDC global research team has already completed 38 reports and is looking forward to helping more clients like Torklift International create strategic, data-driven export plans. Jay Taylor, general manager at Torklift, says the SBDC is an extremely useful resource for Washington businesses that are starting or expanding their export market. “More people should know about the SBDC,” he said.